The Add Event form guides you through what to add, but here are some helpful tips. Description: Enter the event title here. This field must be populated in order to post an event. Keep the description short. Notes: Enter the event description, anything that you want attendees to know about the event. Editor Notes: These appear only to you and other authorized editors in your group. Campus location: As you begin typing a building name, the form will auto-complete the name, which you can then select. All campus buildings are available on their respective calendars. In addition to the campus building, use the Campus room field to add a room number and any special directions that will help people find the event. To add a map link or GPS coordinates, click Switch to location. In order to publish an event to the Campus Event Calendar, Seattle editors must first publish an event on their departmental calendar, and then share it to the Campus Event Calendar. 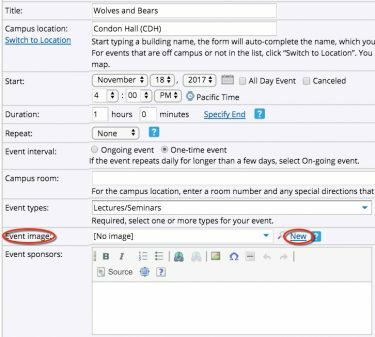 It is not possible to publish an event directly to the Campus Event Calendar. Most calendars in Bothell and Tacoma will automatically display on their campus calendars. On your departmental calendar, click Add Event and then enter your event details. On the right side of the screen, under Also Shows On, view the list of calendars. Select UW Seattle Campus Event Calendar. It’s not difficult to add an image; you just need to make sure you’re in the right part of the edit view. When you are creating or editing an event, to the right of the Event Image field, click New. 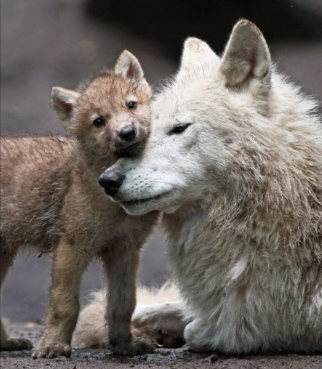 In the Add an Image screen, click Choose File and navigate to an image file on your computer. 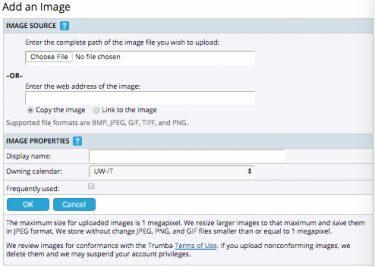 Or enter the publicly visible web address of the image you want to use. In the editor view of an event, click the Preview button. What if my event doesn’t match the available event types? Currently, we are not creating additional event types. Selecting multiple event types will help more people find your event when they filter on event types. 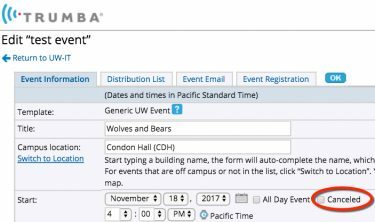 If you think that none of the existing event types accurately describes your event, submit a request for an additional event type to help@uw.edu and add “UW Trumba Calendar” in the subject line. Locate your event in the editor. When you want to cancel an existing event, rather than deleting the event, we recommend that on the Edit Event page, you check the Canceled checkbox. The event will be labeled CANCELED and remain on the displayed calendar. This method allows users to see that the event has been canceled. Deleting the event removes it from the calendar, which could mean that users will miss the fact that the event has been canceled. 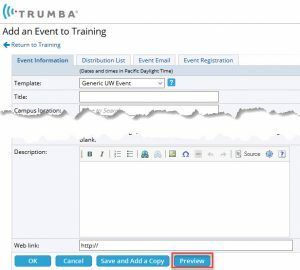 For complete instructions on canceling an event, see http://www.trumba.com/help/events/eventcancel_how.aspx.